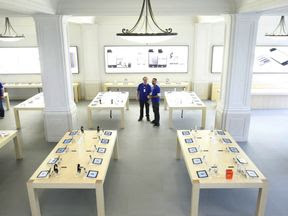 An Apple store in the Netherlands was evacuated after an iPad battery exploded and released noxious fumes into the air, according to reports. Three members of staff at the shop in Amsterdam had breathing problems and were treated at the scene, the city's fire service said in a tweet. A member of the fire service suggested a damaged battery was to blame, according to Dutch website iCulture. Employees at the store reportedly put the iPad in a bucket of sand following the "explosion", although there was no smoke or fire. The store has since reopened following the incident on Sunday.